Last Saturday was our anniversary. Since the weather had been so wonderful that week, we decided to go out for lunch, then fire up the bbq for dinner. We went to Milestones and had a very nice lunch. Have you had the watercress dip with the fries? Yum. Our plan for dinner was some light appetizers, then steak and salad. By 7:00, we still weren't all that hungry, so we changed our plan to only the appetizers. 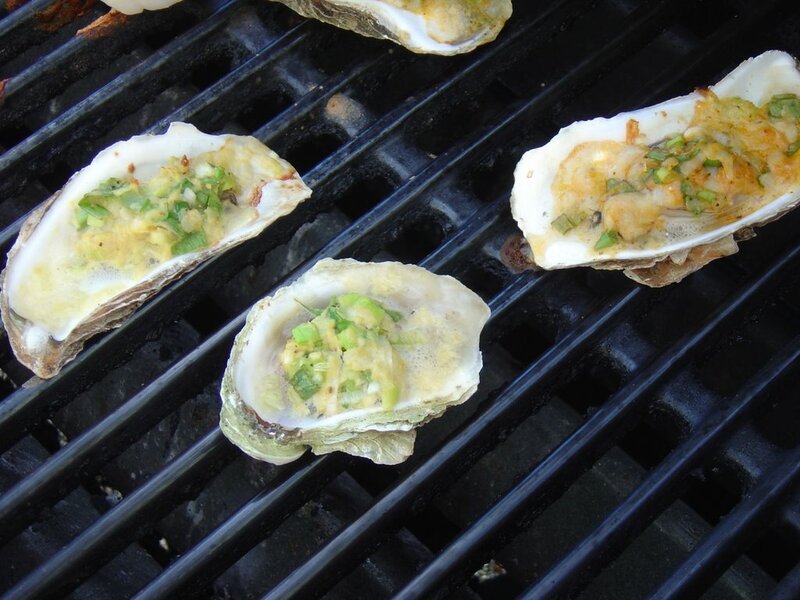 We had bbq oysters and chorizo and scallop brushetta. 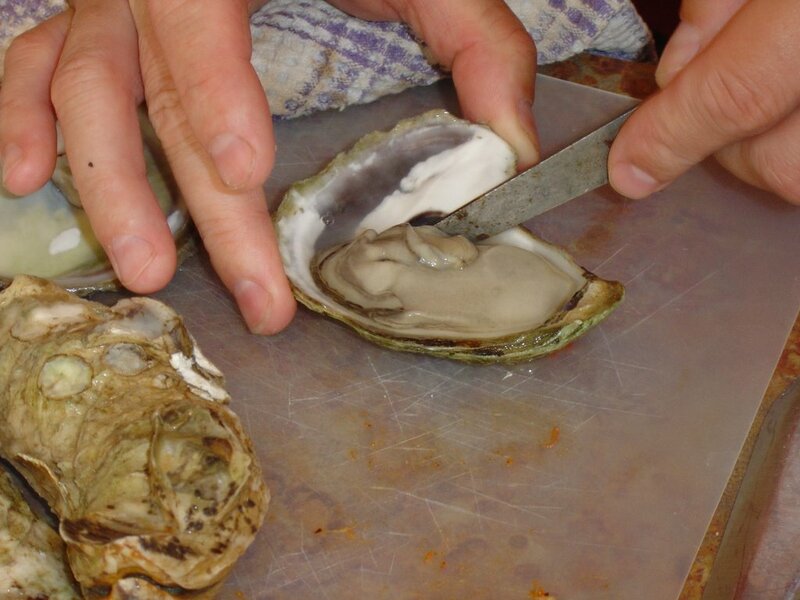 Here's Scott shucking the oysters. 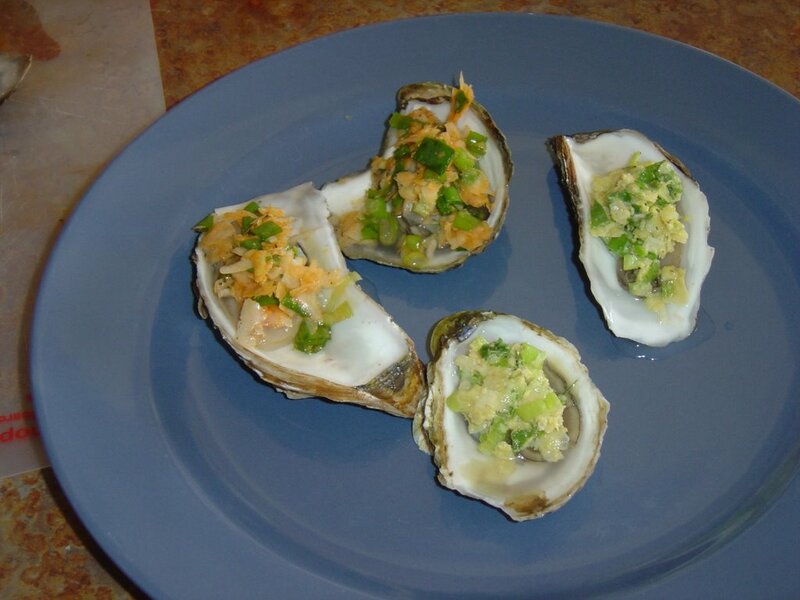 The 2 on the left are covered with a mixture of parmesan, lemon juice,hot sauce, Worcestershire, salt and pepper and green onions. 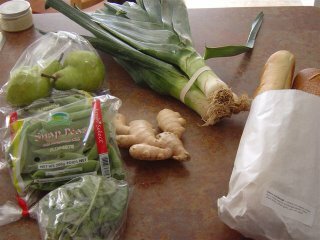 The 2 on the right are covered with parmesan, dijon mustard, green onions, and salt, pepper and lemon juice. 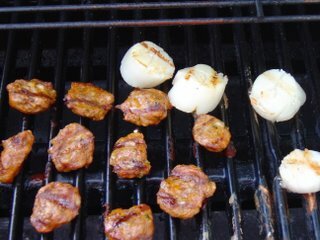 Here's the Chorizo and scallops, madly bbq-ing away. I could not have asked for a better anniversary dinner. I was inspired to make the brushetta from a meal we had last summer in BC. It was whole small scallops with chorizo in a chimichuri sauce. This is my version. To make the sauce, broil the red pepper until softened and blackened in spots. Place in a small bowl, cover with saran wrap and let stand for 20 minutes. Then peel and remove the seeds. Cut the pepper in half, reserving one half for another use. 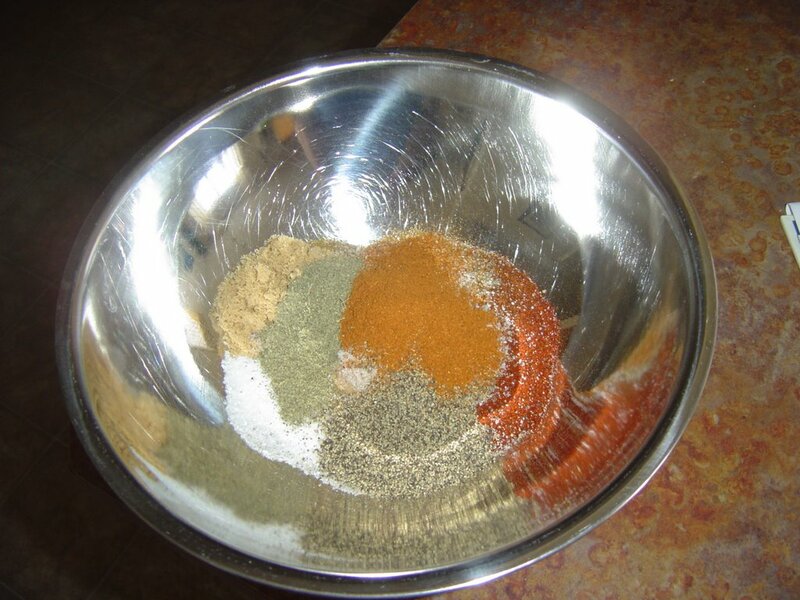 Slice the half pepper into strips and place in a blender or food processor with the garlic and oil. Blend until combined. Season with salt and pepper and set aside. Grill the scallops and chorizo on a bbq or grill pan. Slice each round of chorizo into 2-3 strips. 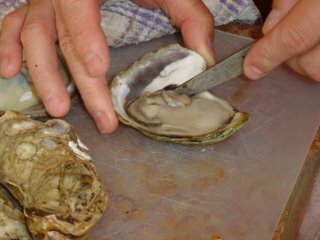 Carefully slice the scallops into thin strips. Toss the scallops and chorizo with the sauce. Pour into a bowl and serve immediately with bread on the side. 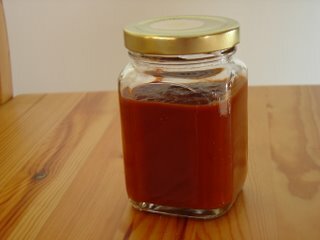 We love hot sauce in the iliketocook household. It goes on everything - eggs, potatos, veggies, burgers, tomato slices, sandwiches, even bagels with cheese. From left they are: Congo Cowboy Mango Barbeque Sauce, Scarlet O'Pepper (The Genteel Hot Sauce), and Grandma Shivji's Chile and Garlic Hot Sauce. I am really excited about trying them out; I've never had these ones before. 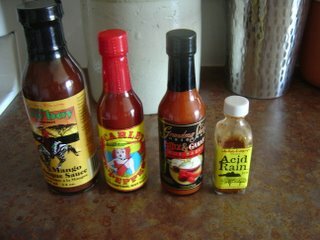 The small bottle on the right is their Acid Rain hot sauce. 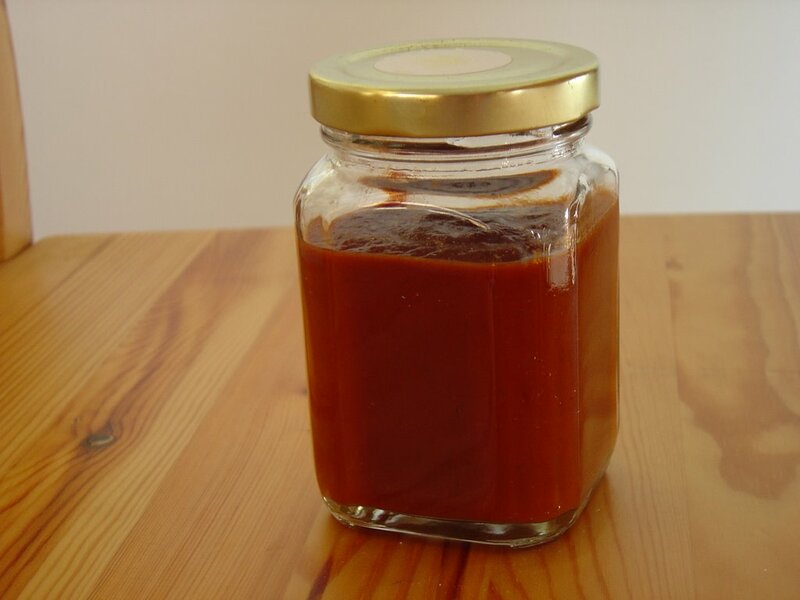 This is one mighty hot sauce. We've been working on this bottle for about 2 years now, and are almost halfway through it. It is so incredibly hot that one drop per plate of food is usually enough. Let's look at the list of peppers in the ingredients - habanero, piquin, ring of fire, peri-peri, tepin, and jalapeno. Damn. All you Calgarians and Albertans out there - keep an eye out for this brand. You won't be disappointed. Watermelon, some kind of squash, red potatos (for $1! 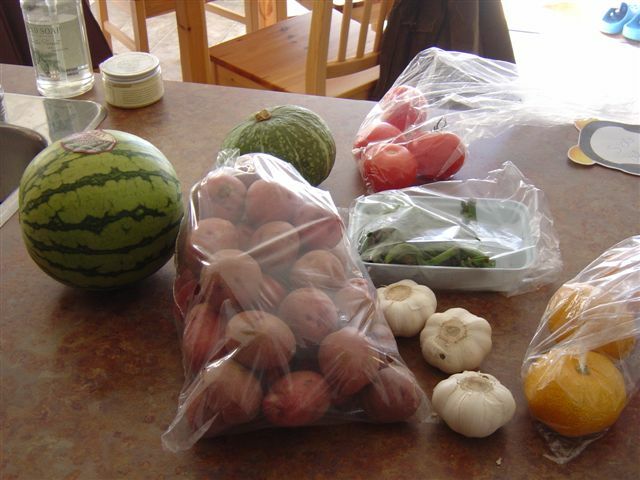 ), tomatos, fiddleheads, garlic, oranges. a big bag of peppers, fresh corn tortillas, jicama, 2 cans of chipolte peppers (Morgan! I got them at the Cookbook Company store at the Calary Farmers Market), a mexican spice for fruit and vegetable, chipolte hummous and crab and lobster dip. So this past weekend was a long weekend in Canada. We had plans for Saturday and plans for Monday, but nothing going on Sunday. The weather forecast was promising, so we thought we'd spend the day on the deck, reading, listening to music and maybe have a beverage. 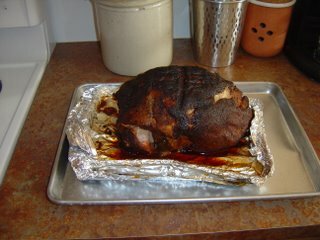 On Saturday Scott found the 10 lb pork roast in the freezer that we had bought from Sobeys on sale, and suggested we try to cook it on the bbq. And so begins our 10 hour journey to dinner on Sunday night. 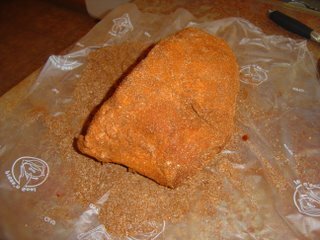 Our spice rub - I won't make this again. Too spicy. The roast, ready to go on the bbq. 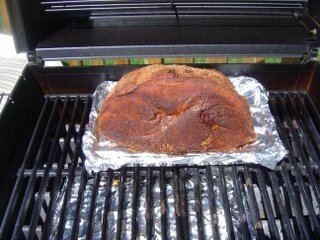 The pig, an hour into cooking. All told, this was totally worth the 10 plus hours. The only thing I will change next time will be the rub - I want it less peppery. 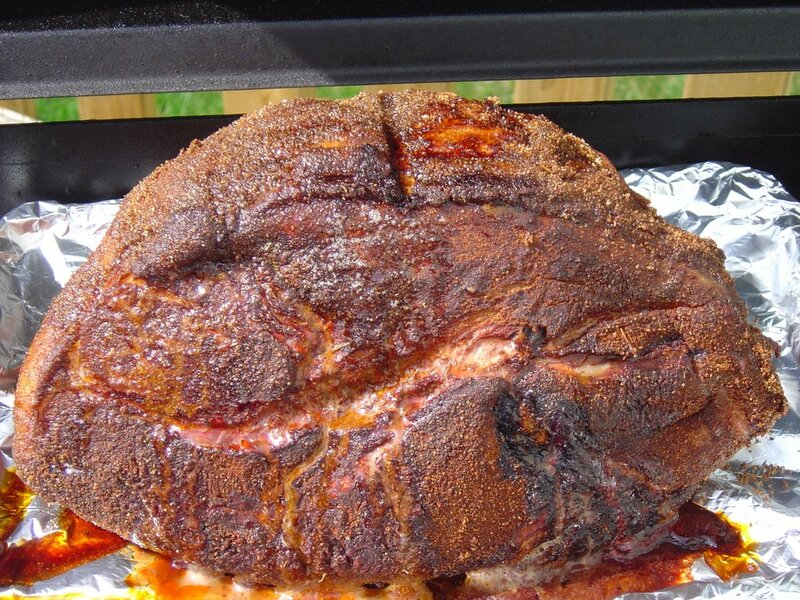 If you have a whole day to spare and a full tank of propane, try out some bbq. Tasty! This whole process takes 9-10 hours at least, so be ready early with your roast. Remove any skin from the roast, but leave on most of the fat. Rub the roast with the rub, covering the whole roast. 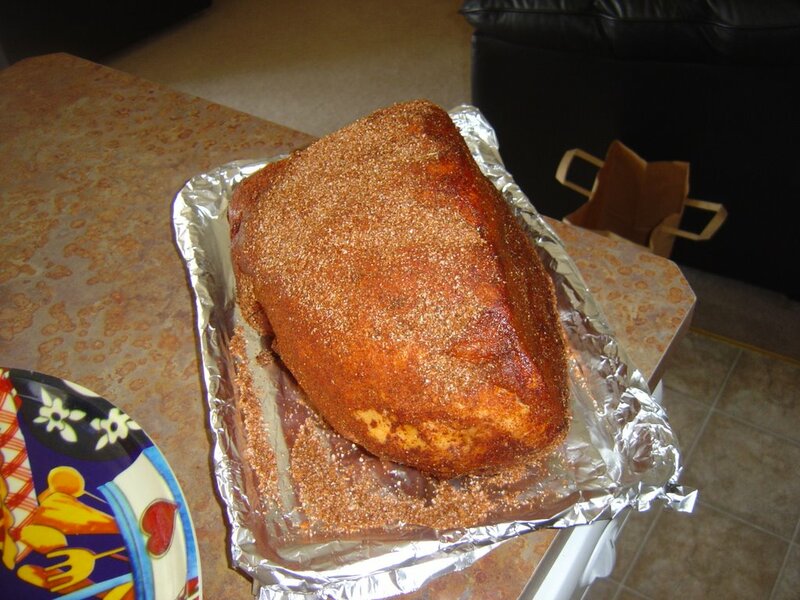 Wrap in plastic wrap and refrigerate for at least 2 hours and up to 2 days. 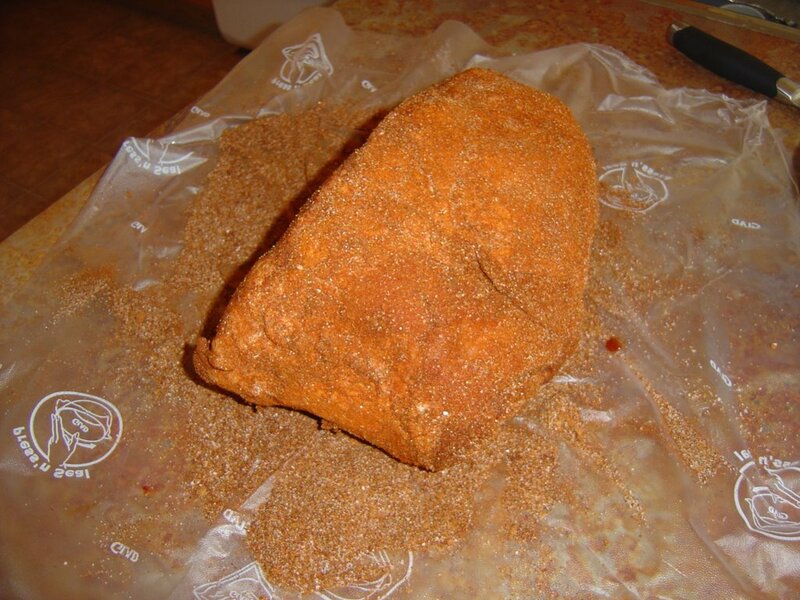 One hour before you start the bbq, remove the roast from the fridge. Unwrap it from the plastic and let it sit on the counter. Place the wood chips in a large bowl and fill with water. Let sit one hour. 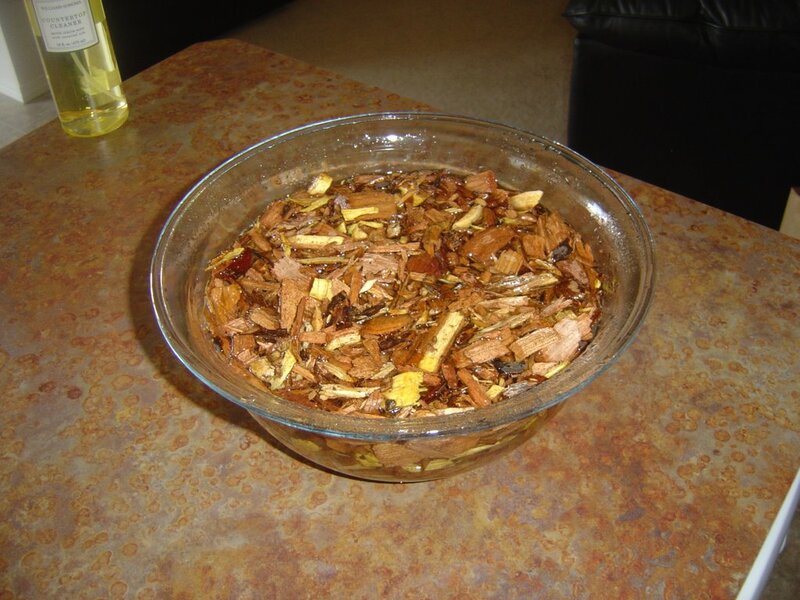 Make a large foil pouch for the wood chips, and poke 5 or 6 holes in the top. Lay over the front burner on the bbq, and light all burners on high with lid down for 20 minutes. Turn the front burner down to medium, and turn off the other burners. Place the roast on the tray, and put the tray on the bbq, over the burners that have been turned off. Do this quickly to try not to lose too much smoke. Cook with lid down for 3 hours, maintaining a temperature of about 275'. Cover roast with a piece of foil, and turn heat up, on front burner only, to 350'. Cook another 2 hours. Turn off bbq and let sit 30 minutes. Remove tray from bbq and wrap tray and roast in foil. 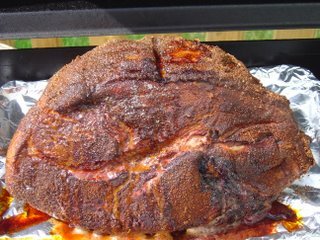 Return to bbq, cover down and let sit for 1 hour. Remove roast from tray and let cool enough to be able to shred meat. Discard fat and any bone. Serve as is, or on buns with sauce. Makes a lot! Cook onions in oil until just starting to color. Add remaining ingredients, and simmer uncovered over low heat for 2 hours. Puree until smooth. Time is a precious commodity. There never seems to be enough hours in the day for all we need to do. So when you come across a cookbook that offers you tasty meals that are quick to make, you've hit pay dirt my friend. That's how I felt when I opened my copy of I Want My Dinner Now! by Renee Pottle. This cookbook offers over 80 recipes, basic cooking terms and information, and plenty of "Cooks Tips" to make your job even easier. One of my favorite things about the book is the serving suggestions. With every recipe, Renee offers recommendations for side dishes. What a help that is. And because there are only 2 of us at home, it was nice to see that all the recipes had quantities for both 2 and 6 servings. The book is divided into four sections: Fast and Simple, Toss It In The Oven, One Pot Meals, and Let's Use Those Appliances. The last category was my favorite. With a kitchen full of gadgets that seem to have limited uses, it's great to learn a new use for them and make these appliances earn their keep. It never would have occurred to me to cook fish in my rice cooker. What an amazing idea. Scott and I enjoyed every recipe we tried in this book. His hands down favorite was Laurie's Thai Chicken. 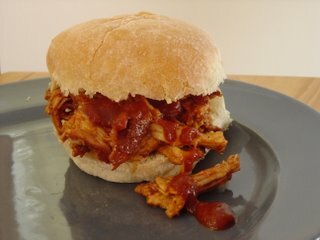 Made in the slow cooker, the chicken simmers away in a delicious sauce of salsa and peanut butter, among other things. I made enough food for 4 people and Scott ate every last bit of it. I can't name only one favorite recipe, but the Greek Frittata was close to the top of the list. Never having made a frittata before, I was shocked at how easy it is. The feta cheese and zucchini was a fantastic touch. I would highly recommend this cookbook to any cook that needs some recipes for quick meals at the ready, whether it be on a daily basis or just from time to time. It's a great addition to my cookbook collection. I Want My Dinner Now! 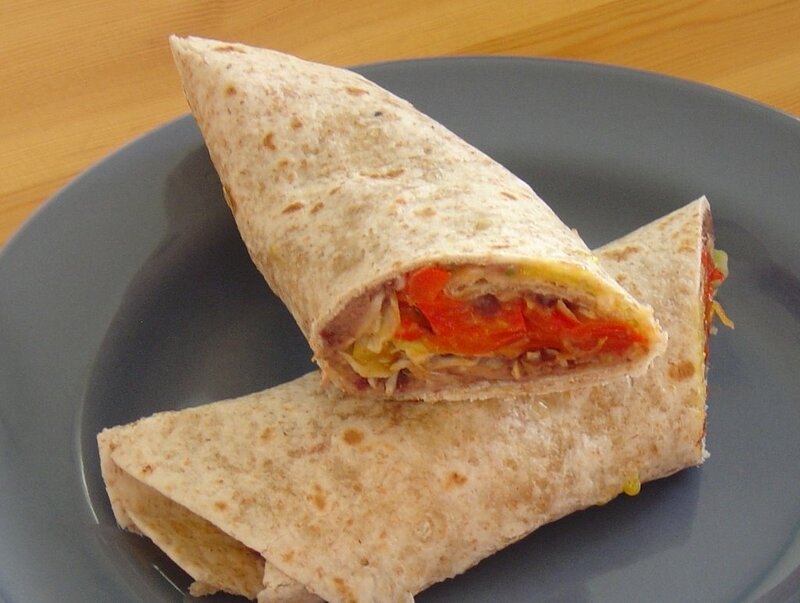 Simple Meals for Busy Cooks written by Renee Pottle. Published by Hestia's Hearth Publishing. available through Hestia's Hearth Publishing, Amazon.com, and Barnes and Noble. Here's the last Mothers Day post. This was fun and brought back a lot of memories about me and my mom in the kitchen. I found this recipe the other night while looking for another one of my mom's recipes to post. I loved helping my mom make this because she'd "let" me squeeze the lemons (Yeah right let me...who likes to do that? NO ONE. That is what gullable children are for.) I haven't had this in years and years, but I can remember exactly what it tastes like. 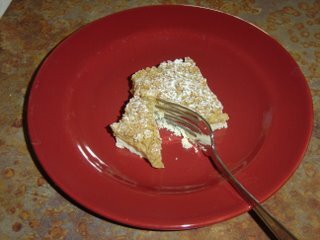 The sugary shock of the lemon juice poured over top, the crumbly cake...I might need to make this very soon. Combine shortening thru lemon rind and pour into a greased loaf pan. Bake at 350' for 1 hour. Mix together the sugar and lemon juice and pour over the cake while still hot. Let cool and remove from the pan. From my mom, who adapted it from Self Magazine. 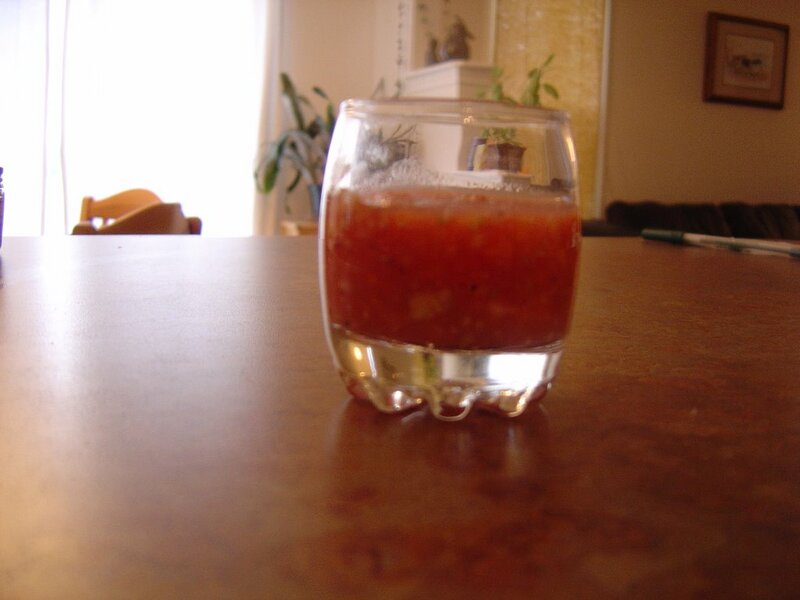 In a food processor or blender, puree the garlic through tomatos until smooth. Refrigerate 1 hour, then strain thorough a sieve. Return the liquid to the processor and add the remaining ingredients. Pulse until you reach the desired consistency. Taste and season with salt and pepper. My parents love to entertain and to try out new recipes all the time. This one was in her arsenal for years. I loved it as a kid and still love it now. I've been making this for parties and dinners ever since I moved out on my own. It's simple and quick to make and is highly addictive. Cover with plastic wrap and chill for at least an hour before serving. Serve with tortilla chips. 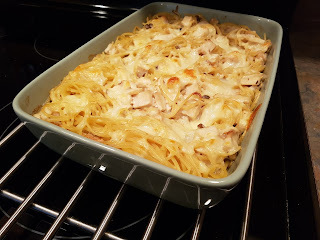 I can't believe I've had this blog as long as I have and have yet to post this recipe. It's a crime I tell you. This may be one of my mom's best recipes. 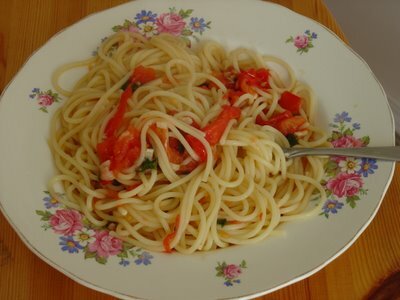 This pasta is best made when the tomatos really taste like tomatos. 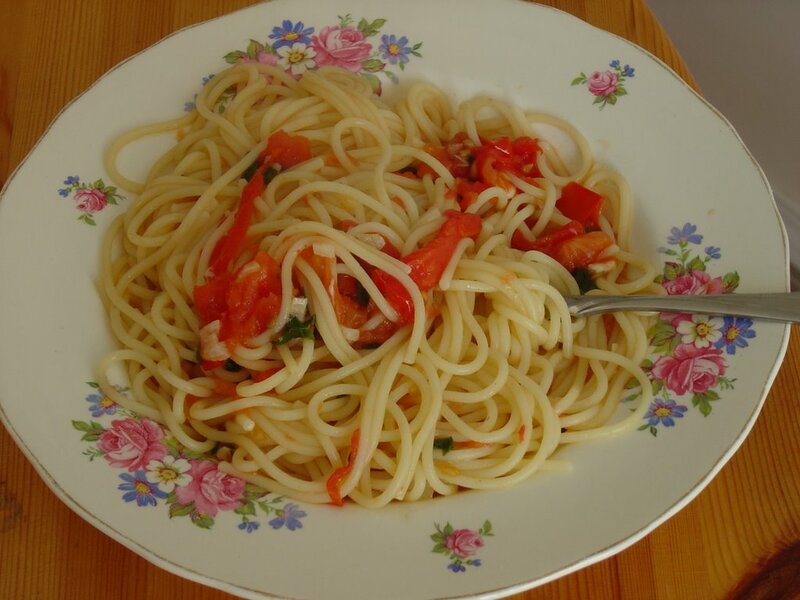 Like true Italian pasta, it is dressed very simply. The sauce is thin, and the slivers of tomato just melt into it. Make sure you have a good appetite and a big piece of parmesan when you make this. Boil water for the noodles. When you add the noodles to the water, begin to make the sauce. Slice the tomatos very thinly. Saute the garlic in 1 tb of butter until it just starts to color. Add the wine and simmer for 1 minute. Add the broth and simmer 3 minutes more. Add the tomatos, basil and 2 tb butter. Simmer until the noodles are done. Season the sauce with salt and pepper if needed. Drain the pasta and pour into a bowl. Pour over the sauce, grate in lots of parmesan. Mix together and plate, making sure all portions get some of the sauce from the bottom of the bowl. Anyone who knows me knows I am a real potato fiend. When I was little, I'd eat them at every meal if I could. My mom taught me how to use the blender to make these. She'd serve them with sausage or ham, and sometimes on their own for a special breakfast. 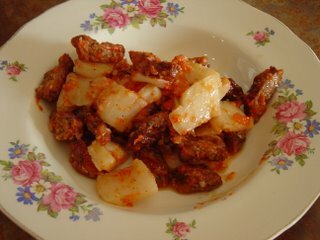 Serve with applesauce, sour cream or butter. Put 1/2 cup of potato, plus all other ingredients in a blender. Cover and process on "Grate" until all the potatos have gone through the blades. Add the rest of the potatos and blend, but leave a little chunky. Heat pan over medium high heat. Add a splash of oil, and spoon 2-3 tb of batter per pancake. Serve right away. Like most people, my mom taught me to cook. She taught me to enjoy cooking, to be brave and experiment. That if those experiments don't work out, it's not the end of the world. Mom taught me that cooking is a family affair. Even now when my parents come to visit, or when we go to their house, all four of us cram in the kitchen to help. That is a tradition I will pass on to my child one day too. So to celebrate my mom, every day this week I'll be posting a recipe that she taught me. Happy Mothers Day to my mom, and to all the moms out there. this is one of the first recipes she taught me to bake. And they really do taste like donuts! In a bowl combine the flour, baking powder, salt, nutmeg and cinnamon. In a second bowl, combine the oil, sugar, egg and milk. Add the liquid ingredients to the dry and mix only to combine. Pour into muffin tins and bake at 350' for 20-25 minutes. Turn the muffins out immediately and while hot, dip the tops in the melted butter and then in the cinnamon sugar. Check out this website, yo. 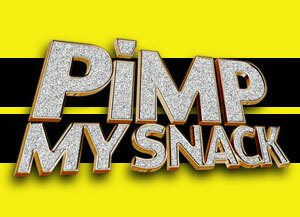 Pimp My Snack. takes snacky food to the next level, or even dare I say, to the extreme. Who among us, at one time or another has not craved a humongous Almond Joy? No one! Some of my favorites- the giant kit kat bar, crunchie bar, and the very cool oreo. I am very excited about this months WCC challenge - celebrating Cinco De Mayo - because I love, love, LOVE Mexican food. Sadly, there are not many Mexican restaurants in Calgary. So I am looking forward to combing through all the entries to look for tasty dishes to try. I made two dishes for WCC - a soup and main course and was thrilled with both of them. The soup, Spicy Zucchini with Rice and Lime came from a small cookbook I got out of a discount bin. 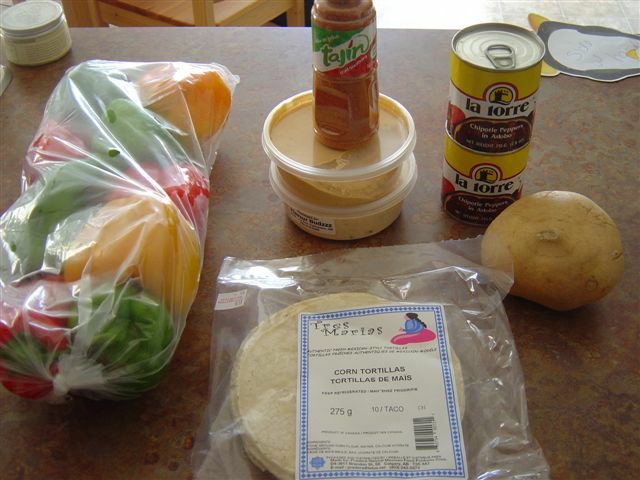 It's called "Cookshelf Mexican" by Marlena Spieler. The main course - Calypso Roti with Mango Mojo came from my current favorite cookbook Rebar Modern Food Cookbook by Audrey Alsterberg and Wanda Urbanowicz. I am crazy about this book; although this is the first thing I have actually made out of it, I have read it cover to cover three times and have marked almost every recipe to try out. 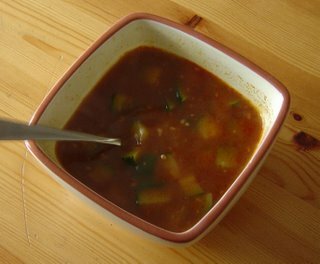 Spicy Zucchini Soup with Rice and Lime by Marlena Spieler. This soup is a snap to make, an amazing color and made the house smell incredible. 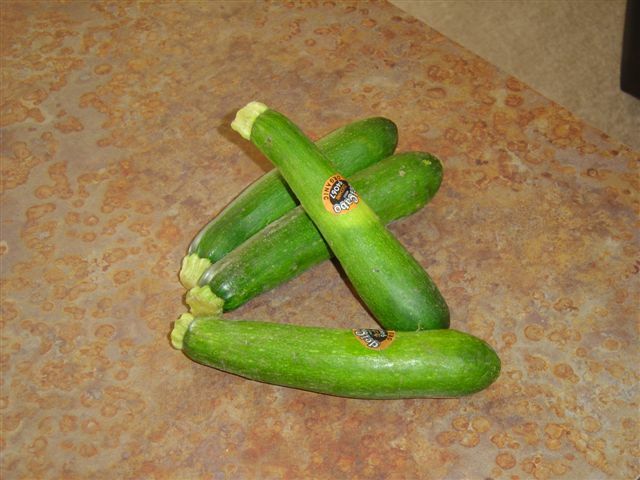 If you like zucchini, make this soup. Heat the oil over medium high heat, add the garlic and cook until the garlic just starts to color, 1 or 2 minutes. Add the chile powder and cumin and stir for 1 minute more. Add the stock zucchini and rice and simmer for 10 minutes, until rice is cooked and zucchini is tender. Season with salt and pepper. Pour into bowls and squeeze lime over top. Everyone should own this book - it's a wonder. The mojo is so incredibly good and I bet would be amazing with shrimp. An extra plus - there's no fat! Combine the beans through cilantro in a food processor and process until combined and the consistency you would like. Season to taste. Wrap tortillas in foil and warm in a 300' oven. Thinly slice the peppers. Heat oil over medium high heat and saute peppers until soft. Romove tortillas from oven and spoon beans down the centre. Top with the peppers and cabbage and drizzle with the mojo. Roll up and serve. Hi everyone, I wanted to remind you that the deadline for the Weekend Cookbook Challenge is May 15. This months challenge is Cinco De Mayo. The WCC celebrates the fact that all of us have cookbooks we rarely or never use. The challenge is to dig them out and re-discover them.